Seriously, I know I gush about Fallen Earth and their dev team a lot, but how can you not develop a crush on them when they’re constantly pumping out stuff like this? Touch Arcade went to PAX and brought back a bit of new info in the form of a teaser trailer for Galactic Keep: Space Battles. Oddly enough, this is my #1 most anticipated iPhone game, and it looks like it’s shaping up to be terrific. It’s meant to mimic a solo tabletop RPG session, with collectible loot cards, random encounters, and branching storylines. Can’t wait! “What use is it to spend one’s time in an imaginary fantasy world either as an author or a reader? Shouldn’t we be dealing with the real world? 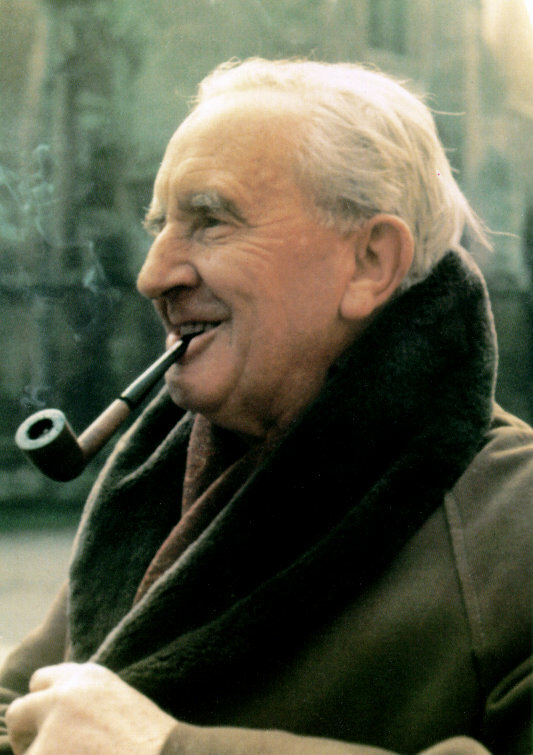 In addressing this question, Tolkien openly challenges the modernist and post-modernist assumptions about the world. I would add that Tolkien’s ideas about this and the dominant 20th century philosophies is a big reason why his works are still not taken seriously by literary scholars today. English professors as a group tend to rule Tolkien out of the literary canon without blinking, largely because fantasy stories about elves and dragons obviously cannot be serious literature. Near the heart of this assumption lies this idea of escapism — it’s not “serious literature” because it does not deal with the real world and therefore is viewed with disdain. Sound familiar when it comes to MMORPGs? He goes on to talk about how Tolkien says that if there is a greater world beyond this one, then engaging in fantasy stories helps to free our imaginations, to see past the “shadow” of this mundane world to a better one. Works of fantasy, since they’re so different from our own world, cause us to see everything around us fresh and making them strange, by “freeing them from the drab blur of familiarity”. 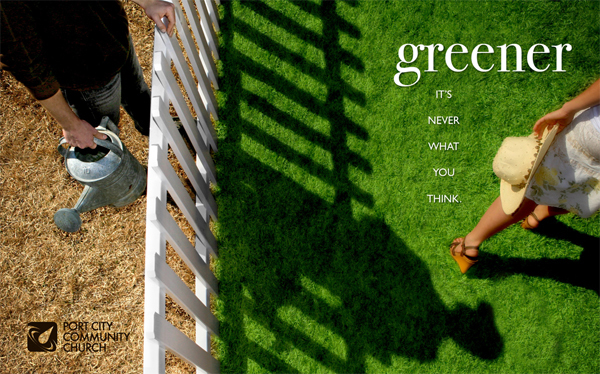 Ultimately, he argues that by engaging in fantasy and healthy escapism, we become less desensitized to our own world and start seeing it again and appreciating it again. Anyway, this really appealed to me, because I often challenge myself (and am challenged by others) to defend why playing games and MMORPGs is in any way a good thing, and not a waste of time. The above quotes help to define what I’ve believed for a while, that in engaging in a story in an active way, you become a co-author as well as a reader, and you can bring something positive of that back to your daily life. I have some sort of debilitating sickness in my head that always works against me when I’m deep into a MMO. It’s one of the things that causes me to stutter out in the mid-levels of a game and reroll an alt or jump to another title. I think of it as “the grass is greener on the other side” phenomenon, where I start getting obsessed about playing a different class or game while I’m hip-deep in a mindless grind or a slow leveling curve. Right now, in LOTRO, I’ve got my burglar up to level 25 and am plowing through Lone-Lands, mentally preparing myself to scale the cliff of content I already have done with my captain. I’m enjoying the burglar, he’s fun, but the second I’m not playing another class is the second I start thinking of them fondly and missing all of their qualities. I miss a pet! I miss heavy armor! I miss whosits and whatsits! Before I know it, I’m just salivating over the notion of playing the class I’m not currently playing, and it begins to drive me mad. Some of you might say, “Well, why not just rotate between three or four alts and play them all?” That’s a possibility, but it never works for me. Trying to concurrently play multiple alts usually kills my interest in a game faster than anything else, because I don’t feel anchored. Still, I want to play my captain, a LM, a minstrel, a warden, even as I’m enjoying my burglar. It kills me. What’s worse is when I get really high up in levels and I feel as though I’m locked in for good with whatever I chose at the beginning. Before I left WoW, I got my druid up to the cap, but started to feel miffed that that was the class I ended up with. I started looking enviously at other classes, like the shaman, and wishing I could play one but just exchange the hard work I’ve already put in with the druid, level-wise and gear-wise, into a different class. I think it’d be ten kinds of awesome if MMOs would let us switch classes at end game, perhaps through an involved process, so that we didn’t have to reroll and lose the character we’ve grown to love. If there was meaningful effort behind the switch, then it wouldn’t be a trivial thing, and players would have another thing to do at the level cap. I don’t know. Weird thoughts for a Tuesday morning. One of the best things about LOTRO, in my opinion, is just how different the classes feel from each other — and, in many cases, how different they feel from contemporary classes in other titles. I’ve spent a good deal of time with four of the nine classes, and while some of them shared types of skills and abilities, they had their own style and unique twist. The Captain, as Spinks once said, is one of the truest hybrid classes you’ll ever come across in any MMORPG. They can do a lot adequately, or with a lot of work, a couple things very well. The Lore-master is a bizarre mix of crowd control, DOTs, pet handling and debuffing, which really throws people off when they figure a LM is the typical mage class cannon as seen in other games. The Minstrel, on the other hand, uses song to heal and hurt, but can shift between offense and defense based on the situation. 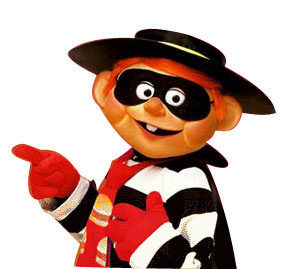 This brings me to the fourth class I’ve marinated in, the Burglar. I think a lot of folks would take one glance at this guy, see the stealth and dual-daggers/weapons, and think “Oh, it’s a rogue.” Except, it’s not. I mean, sure, it certainly shares common traits of rogue-like classes — double weapons, sort of squishy, burst damage, attack from stealth. But Turbine did a great job in giving the Burglar far more depth and utility than that. What I love about my Burg is that she stacks the odds in her favor for every fight with a huge bag of tricks that goes beyond just stealth-and-stab. Sometimes it’s more prudent to get a huge opening crit by hiding in the shadows, using distraction to get the mob to turn around, trigger my auto-crit skill, and then attacking with my heaviest damage attack followed by the special attacks that unlock from a crit. It’s a terrific opener, to be sure. But other times, I’m either not willing to spend the time to prep a stealth attack, or I’m dealing with multiple mobs, in which case the Burg’s other talents come into play. I have very good crowd control in several different flavors, from quick stuns to long dazes to a hard 6-second lockdown. Two mobs, no problem; three, and it’s a bit of a dance, but I usually can come out just fine. Then there’s a lot of other little goodies that come with the package, such as being able to temporarily bump my evasion rating through the roof if I find myself in a hard spot, being able to heal myself on a fairly regular basis, and — of course — start up Fellowship Maneuvers whenever I want when I’m in a group. I’m prepping my Burglar to be a Gambler at higher levels, which really looks like an interesting way to play the class, where you put your faith in the RNG to generate better-than-expected results for various moves. Anything to keep the class fresh, unpredictable and interesting, I’m there. When I started doing the Nostalgia Lane series, I quickly realized that I could spend the first ten articles in it discussing nothing other than adventure games. MAN, I loved me some adventure games back in the day — King’s Quest, Space Quest, Star Trek 25th Anniversary, The Longest Journey, etc. People were quick to pronounce adventure gaming’s death from about 1995 on, even though these games continued to (and still do) endure and thrive. It’s interactive storytelling and puzzle-solving combined to create a fun experience where you have to put in some real effort and brainpower in order to progress the story — not just hit “A” a bunch of times and explode stuff. 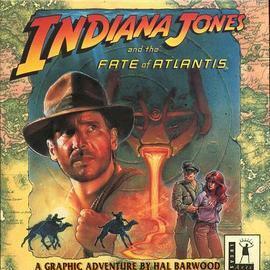 But while I was going to hold off doing another adventure game review, I couldn’t resist dishing out a hearty scoop of Indiana Jones and the Fate of Atlantis. It remains one of the most memorable gaming experiences of my younger years, and it needed to be told. The year was 1992, and I was sweet sixteen. Guys can be sweet sixteen, right? Hm, how about sweaty sixteen? Okay, that really doesn’t sound better. 16. I was. A friend of our family went on a trip and asked me to come over to do some housesitting for a few bucks, which I was more than happy to do, because he had a really spiffy computer setup and was fine with me playing on it. Before he left, the guy told me I had to try this new Indiana Jones game that he beat a week or so ago, and then left me to it. The game in question was Fate of Atlantis, arguably the best Indiana Jones title ever made, and I had no idea what I was in for. All I knew is that, pixels and cheesy MIDI theme aside, it felt very Indiana Jonesish from the start. 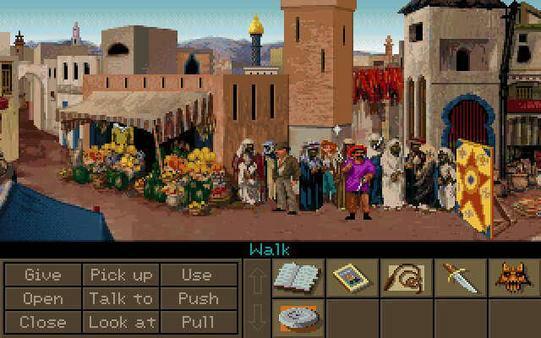 Made by LucasArts and using the SCUMM adventure engine — my first SCUMM game, actually — Fate of Atlantis used a combination of clickable key words, dialogue choices and inventory items to hunt through ruins, stay one step ahead of the Nazis, and find the fabled lost city of Atlantis and its immense power. It was notable in that the middle section of the game offered players a choice to progress in one of three ways: a Fists path (more action, fighting, less puzzles), a Wits path (more puzzles), and a Team path (you use another character more extensively to solve puzzles). That right there made playing through the game three times a requirement, just to see how each path felt. The puzzles themselves were more or less logical, but pretty devious (especially for a high school student), and I found myself in agony trying to progress yet getting stuck on a tricky trap or complicated puzzle without any way to proceed. This was, of course, before the internet and GameFAQs, so my panic button was to call the guy whose house I was watching and ask him for solutions. Even though I must’ve called about ten times over the weekend, he was patient with me and — to his credit — didn’t give me the direct solution, just hints and tips to help me figure it out. All in all, Fate of Atlantis hit the sweet spot that made the Indiana Jones movies work. It was funny, the characters memorable, and the set pieces fantastic. It’s just a shame that I didn’t realize back then how many other SCUMM adventures I was missing out on. While I didn’t find the subsequent Indiana Jones games as captivating, it’s good to know that Steam re-released Fate of Atlantis lately, with voice-over included.